Preble Shawnee’s girls tennis team claimed its third straight SWBL title last week. 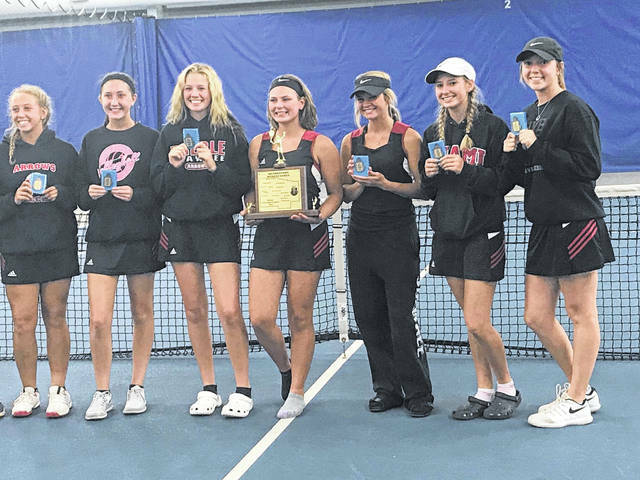 DAYTON — Preble Shawnee’s girls tennis team captured its third straight league championship last week after winning titles at first singles and first and second doubles during the Southwestern Buckeye League Buckeye Division tournament. The tournament was held Thursday, Sept. 27. The Arrows finished with 55 points to outdistance runner-up Milton-Union (48) by seven points. Hubbard said the title is even more special to him since this is his last season at the helm of the program. Allison Zornes won the title at first singles, while Lauren Smith and Grace Deaton won first doubles and Zoey Collins and Destiney Quillen claimed a title at second doubles. Alivia Reek was the runner-up at second singles and Michelle Bulach was runner-up at third singles. Zornes, who missed last season due to an ACL injury, cruised through the first two rounds, before knocking off top seed Meredith Fitch of Milton-Union 6-4, 2-6, 6-0. Smith and Deaton entered the tournament as the No. 1 seed at first doubles and made the seeding stand by winning the title in straight sets over Haley Felts and Jodee Baker of Dixie 6-4, 6-3. Collins and Quillen were also the top seed at second doubles. They defeated Alexandria Allen and Gabby Bates of Dixie 6-1, 6-4 in the championship match. Reek was the No. 2 seed at second singles and didn’t drop a set until the finals, where she lost to Taylor Falb of Milton-Union 6-3, 6-0. Bulach, the No. 2 seed, lost in the final to Hannah Fugate of Milton-Union 6-3,6-3. The Arrows were scheduled to play in the Division II sectional this week. The top four will advance to the district tournament next week.